Thierry Legault’s video of the UARS climate satellite falling. 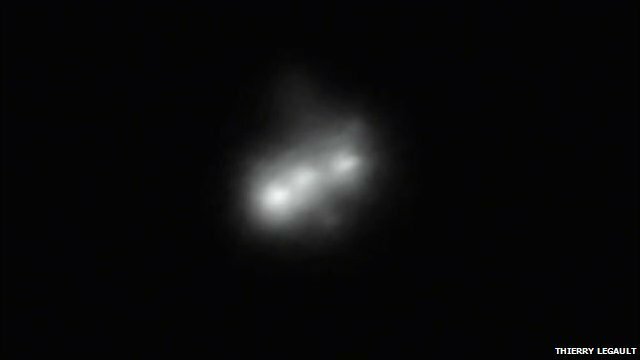 An amateur astronomer has recorded images of the out-of-control US satellite as it tumbles back to Earth. Thierry Legault, from Paris, captured the video as the satellite passed over northern France on 15 September. The six-tonne, 20-year-old spacecraft has fallen out of orbit and is expected to crash somewhere on Earth on or around 24 September. The US space agency says the risk to life from the Upper Atmosphere Research Satellite (UARS) is 1 in 3,200. Mr Legault, an engineer, used a specially designed camera to record the tumbling satellite through his 14-inch telescope, posting the footage on his Astrophotography website. UARS could land anywhere between 57 degrees north and 57 degrees south of the equator – most of the populated world. Nasa says that most of the satellite will break or burn up before reaching Earth. Ronald Reagan under the SDI would have ordered it zapped. This technology has got to be available by now. Use it. Hope it lands on Washington. I really hope this thing takes out my clunker car. I just re-upped my vintage satellite coverage last week! I wonder if Al Gore will blame this too on Global Warming or what ever they’re calling it this week? Theirry’s web site is a must-visit for astronomy and photography fans. I understand the difficulty in accurately predicting when and where it will land is due to its tumbling and twisting ‘attitude’ that will affect its re-entry profile. Looks like they are aiming it to take out Muammar Gaddafi. Who says NASA doesn’t need a swan song. That’s a fairly nice setup. I have a similar, much simpler system I use for tracking ham radio satellites, but it is no where near as accurate as his system. Being able to maintain the satellite’s position in frame that accurately is harder than it looks. That idiot babbler Bush, not content with subverting the economy of the smartest, strongest, greatest and bestest President ever, now he is pelting us with metal from the sky. #1 —- it was then, now, and in the near future, impossible shoot down an object which is 100s of miles away, traveling several miles per second, using any known technology. High school physics scribbled on a napkin can prove this fallacy. Fortunately for the industrial military complex, most Americans are too ignorant to do this type of calculation. We fooled the bad guys with the 100s of billions we spent on the Nike missile system in the 1960s, but this won’t happen again. The risk to life statement is BS. If you mean human life as stated then given the current global population this sucker should take out a million + people. Maybe they meant the odds of it hitting even one human but then they still are clueless because it either will or it won’t.